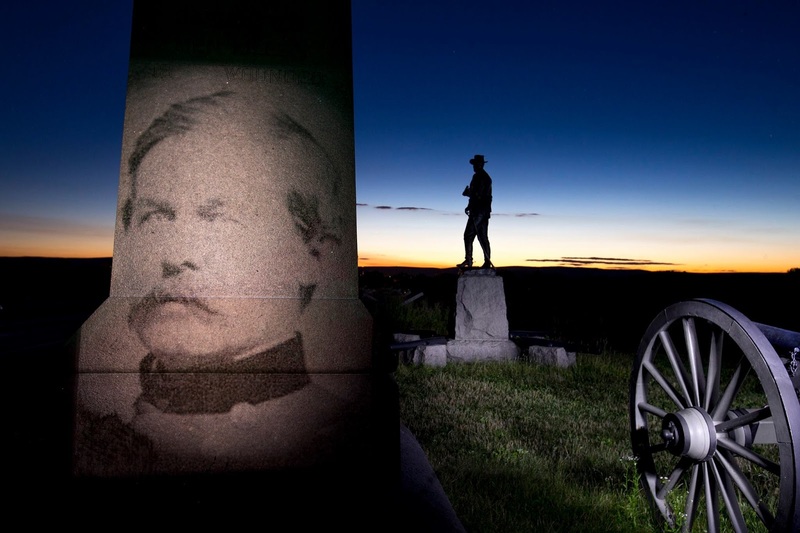 Union cavalry commander John Buford awaits the enemy on Chambersburg Pike. 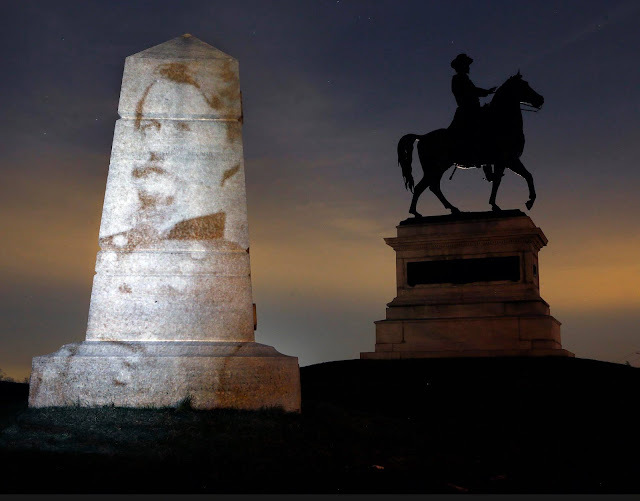 Union Major General Winfield Scott Hancock projected onto a monument on Cemetery Hill. With an iPhone8 and an online training course, almost anyone can shoot reasonably good to great battlefield photographs. My favorite shooting gallery is Antietam, where natural light was optimal last month for these images. 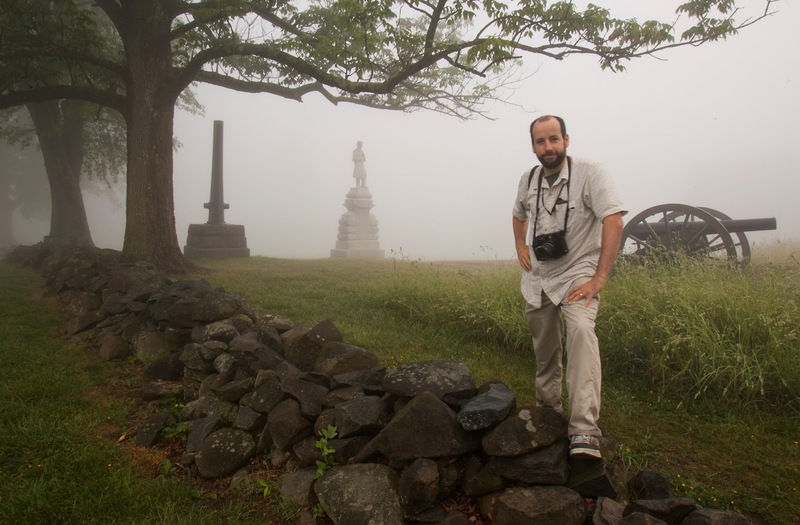 Bill Bretzger, whose photography skills far exceed mine, relishes shooting at Gettysburg. 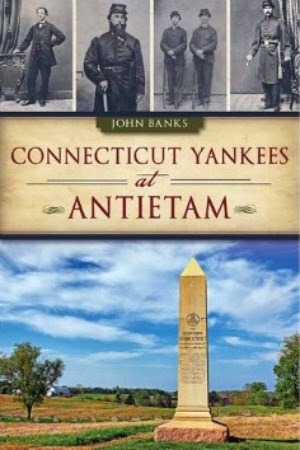 A longtime newspaper photographer, Bretzger first became interested in the Pennsylvania battlefield shortly after the movie about the battle came out in 1993. 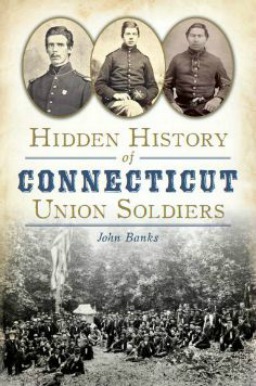 Accompanied to Gettysburg by his brother, Paul, a historian whose book on the battle recently was published, he was captivated by the field's unique topography. 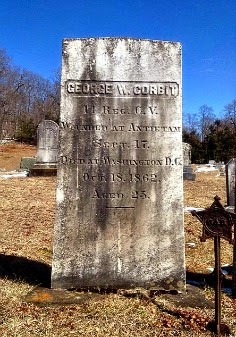 Over the years, his trips to Gettysburg became more frequent. Bretzger shot at the usual spots -- Cemetery Hill, Devil's Den, Little Round Top -- and the usual images of sunsets and sunrises. "I’ve watched interest in photographing the field and the sharing of those images really explode with digital photography and social media," said Bretzger, who also shoots video for The News Journal in Wilmington, Del. "I try to be different, move beyond postcard-type scenes and communicate a story." Where did the idea come from, and is anyone else doing it? Bretzger: I saw a story on a web site that is heavy with camera gadget and gear information about the slide/flash projector I ended up using and put the idea together -- a flash of inspiration (pun intended! ), I suppose, almost right away. There is another photographer, artist Jeff Beekman, who has done a similar series, though our methods and results are fairly different. We each developed the concepts independent of each other. His approach is a little more conceptual in nature, perhaps even more "artistic." Mine is a little more specific about sites and subjects together. People are often curious about the process I work with. I employ a pretty simple "slide projector" that uses a regular camera flash -- it’s not a constant image like in a slide show -- to beam the images into the scene. So I start with a portrait, first using a digital file to print the image at 35mm-size on a piece of transparency paper and cut it down to fit a slide mount. The slide mount goes in the light projector and I flash the image into the scene. 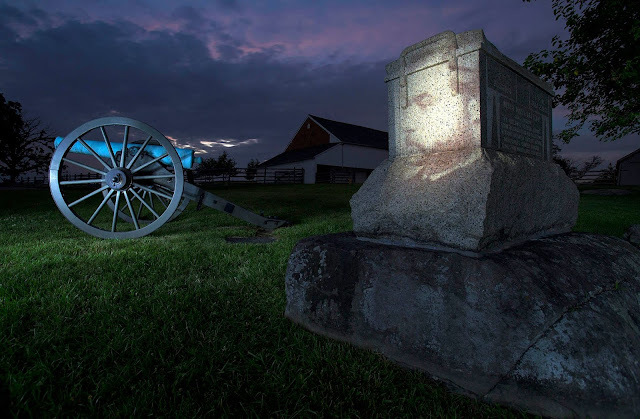 I use a long exposure to record the battlefield image in conjunction with the short flash of light to capture the portrait, all in one frame. I suppose something similar can be produced in Photoshop, but I think shooting on-site gives the images a more real, almost organic and less-contrived feel. The projected image wraps around the subjects, and you see the shadows and ridges and light fall off in a way that would not be easy to accomplish in the computer. President Lincoln and his Gettysburg Address appear on the Pennsylvania Monument. 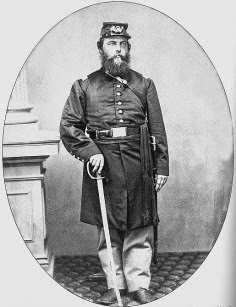 Lieutenant John Emerson of the 26th North Carolina was mortally wounded during Pickett’s Charge. 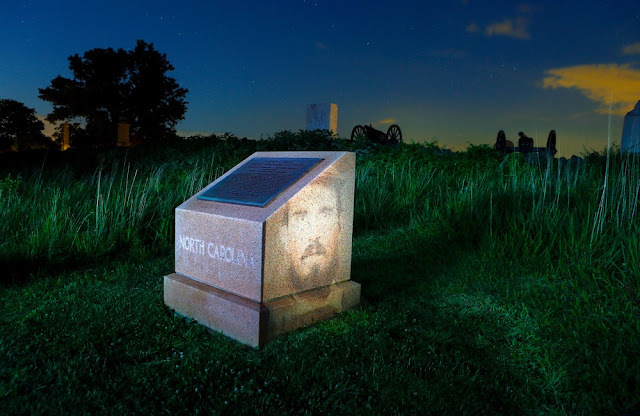 His image is projected onto the 26th North Carolina marker under the guns at The Angle. 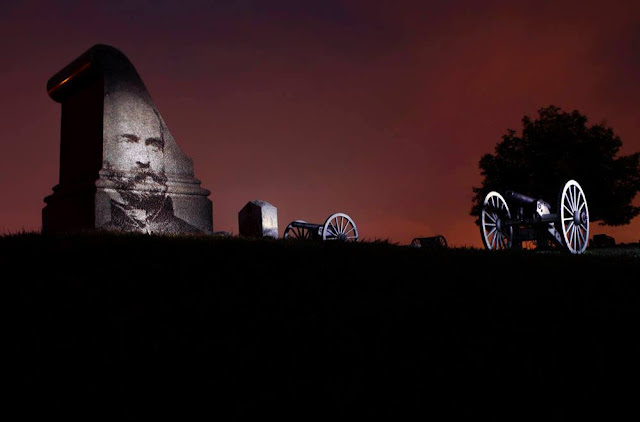 Why the great attraction to Gettysburg? 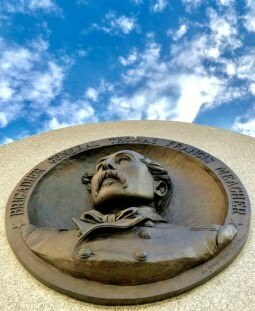 Bretzger: Gettysburg is the closest major battlefield from my location, and has been since I started shooting there when I still lived in New Jersey. 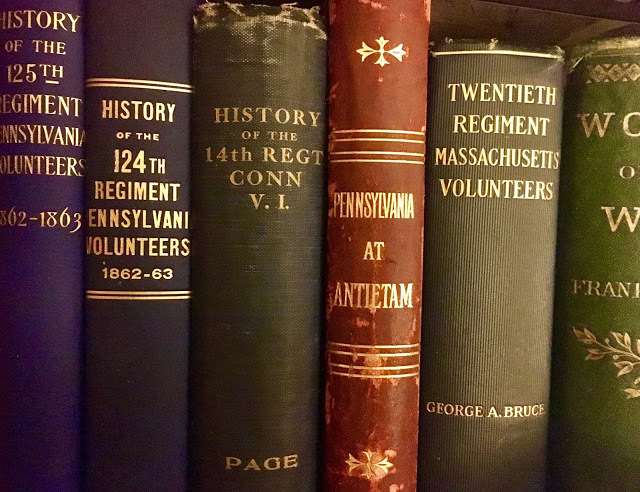 Besides being one of the greatest and most terrible battles of the war, it is also a remarkably varied field for such an otherwise ordinary area of Pennsylvania. Photographer Bill Bretzger at Gettysburg. Obviously the many, many monuments are an attraction to photography. 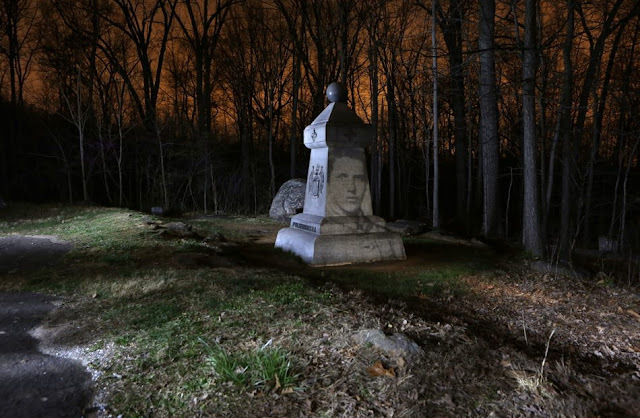 It’s also a well-preserved battlefield with a diversity in landscape, from pastoral fields to rocky hills, Devil's Den and Rock Creek, Culp’s Hill… the Cemetery, so much more. It’s a complex field with three days of action overlapping. I consider myself a student of the battle and the early photography there but know only enough to know there is so much to learn. One important aspect of Gettysburg, for me, is its fairly liberal park hours. When I started taking pictures there in the 1990s, it was still open year-round until 10 pm, so that gave a good amount of time after sunset in the winter to make night images, star trails over the battlefield, etc. They’ve since scaled back the hours for the colder months, but it's helpful to have the later closing times to work with. Of these images you have shot on the battlefield, which one is your favorite and why? Bretzger: I haven’t a real favorite. I suppose I favor the image of Brigadier General Lewis Armistead because of how it all comes together, the guns, the setting, the color dropped right in from the night sky and some town lights. Lieutenant John Emerson and the 26th North Carolina, too. 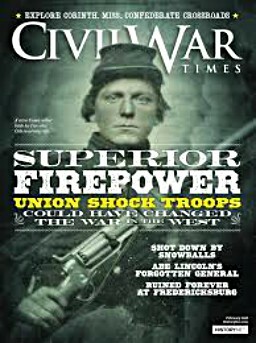 Very stark portrait, his face popped off the cover of Military Images magazine and I knew it had to have a place it would work at Gettysburg. I want to combine these faces with the places that they are closely associated with -- those two can’t get much better for a connection with the landscape. One thing about my work I try to remember as part of my process: there are a ton of nice sunset and silhouette images out there. I’ve watched interest in photographing the field and the sharing of those images really explode with digital photography and social media. I try to be different, move beyond postcard-type scenes and communicate a story. Confederate General Lewis Armistead was mortally wounded during Pickett's Charge on July 3, 1863.
a critical stand here on July 2, 1863. What's the reaction been from the public and the National Park Service? Bretzger: The projections are just one aspect of my work, I work in more traditional black and white, medium- and large-format film photography, and other night imagery of the field, usually with "light painting." But the projections have probably had the best reception, though, I suppose there is some uniqueness to the work and the way the portraits are combined with the field that hasn’t really been seen. I don’t push my work too much right now, I haven’t even a real dedicated website, I’m content with Facebook and Instagram for starters. I’m still trying to catch up on processing and printing or scanning and good deal of work I’ve done. I was an artist-in-residence at the park for a month last year; I used the projected portraits in my application, and I think it intrigued the reviewers, which included the NPS, enough for them to have me part of the program. I’d like to highlight what a great program the A-I-R is; the National Parks Arts Foundation and the NPS work together on it at Gettysburg and other parks. They were extremely welcoming and supportive. 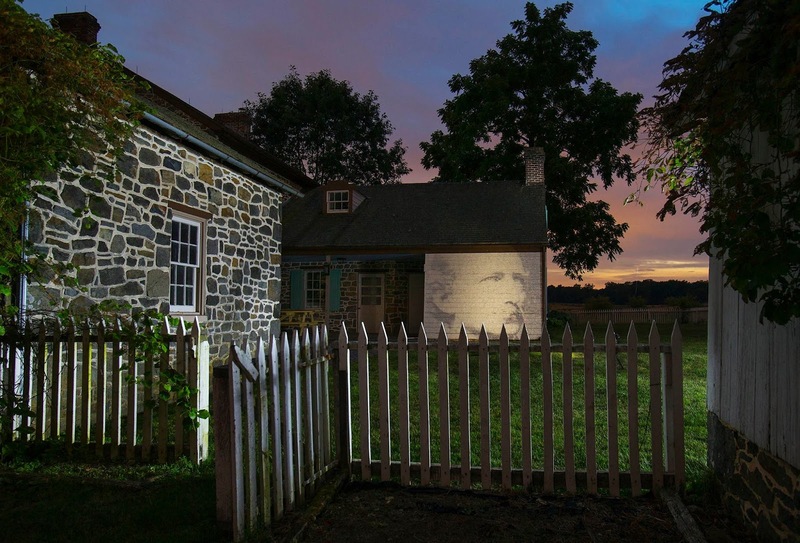 The Gettysburg program puts a range of artists in a historic house in the middle of the battlefield for a month-long residency each. An incredible experience that I still miss! 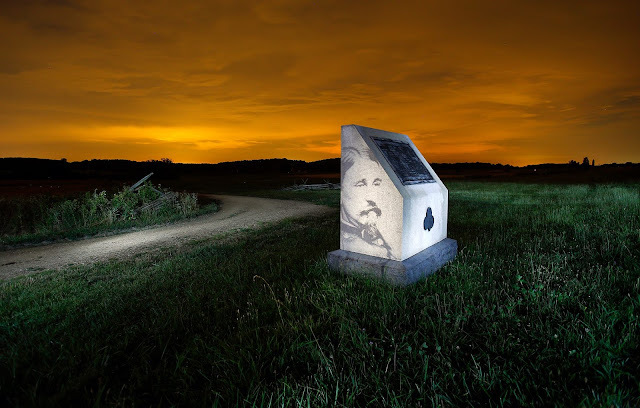 Colonel George Willard and the advance position marker for his brigade near the Daniel Klingel house. 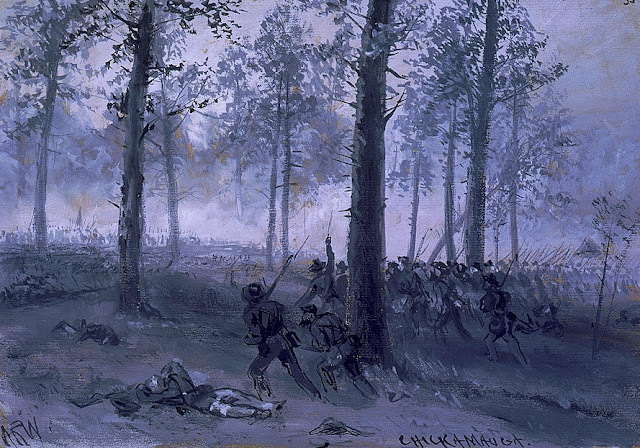 Barksdale's Charge. Willard was killed by an artillery shell during the assault. 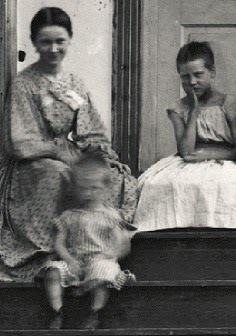 swarmed across the property on July 2, 1863. 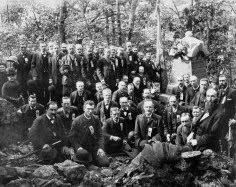 Any place you're eager to shoot using this technique at Gettysburg ... or any other Civil War battlefield? 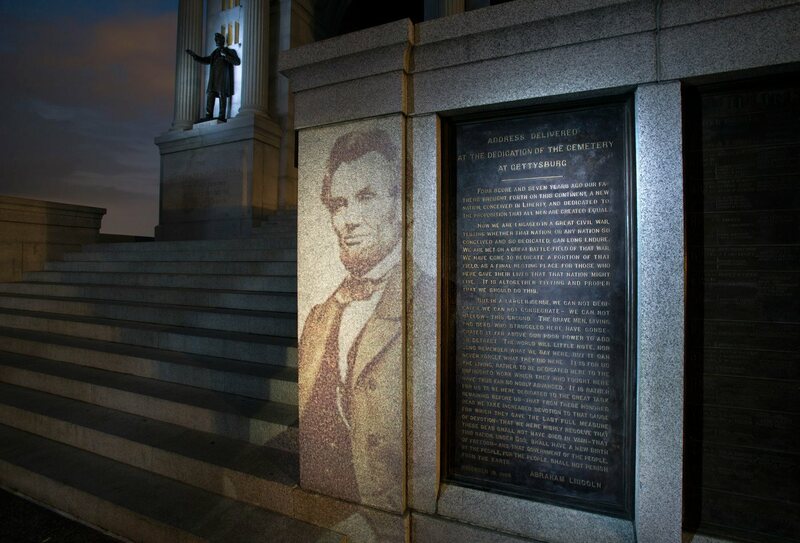 Bretzger: Gettysburg offers a host of what I call "canvases" for projecting portraits into the scenes. It’s really important to have something the images can be shown on. There are large, white walls of barns and houses, monuments with flat, blank surfaces, even boulders that serve as good places to receive the images. 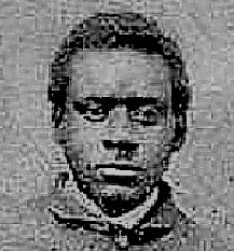 I’d love to find a good image of Abraham Bryan to use at his house on the field, and highlight the civilian side of the battle, especially that of African-Americans. I’m not sure one of Bryan exists. But that’s a location begging for a projected image -- the barn works great, too. Unfortunately, the house is positioned in a way to make it a little tougher with light from the commercial strip shining right there. There are a lot of small challenges to this work you don’t realize until you start trying to line up the images. The portrait, "canvas" and scene have to come together. In the dark it can be a struggle. I love visiting other battlefields, but few offer the sort of multiple opportunities for this work that Gettysburg does. I haven’t branched out anywhere else. There is a lot left at Gettysburg to work with, yet. near here. 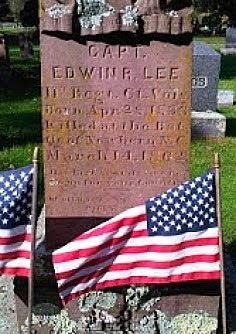 He died as a prisoner on July 7, 1863. 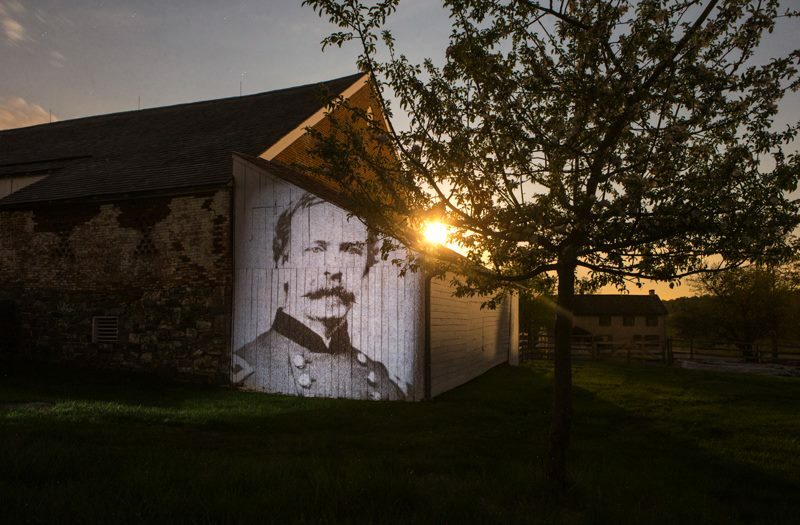 Daniel Sickles' image projected onto the Trostle barn. The Union general lost a leg nearby to Rebel artillery. Excellent, innovative teaching tool. 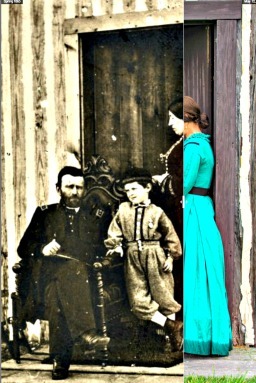 Identifying a person with the location and events that occurred there adds significantly to "humanizing" the conflict & has an indelible effect. Very cool John. These are haunting images.